The Renegade blends sport performance with 4x4 terrain ability. Kayaba HPG piggyback shocks with preload, high & low speed compression and rebound adjustments. Rear Kayaba HPG remote-reservoir shocks with preload, high & low speed compression and rebound adjustments. The first Quads or quad bikes were made during the 1950s. These early models had six wheels instead of four. Honda made the first three-wheeled Quad in 1970, and were famously portrayed in the James Bond movie, "Diamonds Are Forever". Dubbed the US90 and, later, the ATC90, it was designed purely for recreational use. It featured large balloon tires instead of a mechanical suspension. By the early 1980s, suspension and lower-profile tires were introduced on quad bikes.The 1982 Honda ATC200E Big Red was a landmark model. It featured both suspension and racks, making it the first utility three-wheeled Quad. The ability to go anywhere on terrain that most other vehicles could not cross soon made them popular with US and Canadian hunters, and those just looking for a good trail ride. Soon other manufacturers introduced their own models. Sport models were also developed by Honda, which had a virtual monopoly on the market, due to effective patents on design and engine placement. The 1981 ATC250R was the first high-performance three-wheeler, featuring full suspension, a 248-cubic-centimetre two-stroke motor, a five-speed transmission with a manual clutch and a front disc brake. For the sporting trail rider, the 1983 ATC200X was another landmark machine. 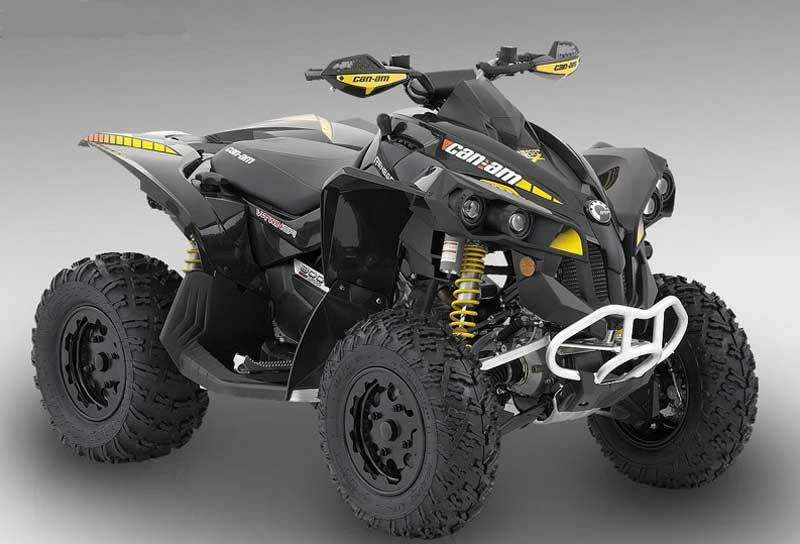 It has an easy-to-handle 192-cubic-centimetre four-stroke that was ideal for new participants in the sport. Suzuki was a leader in the development of 4-wheeled quad bikes. It sold the first Quad, the 1983 Quad Runner LT125, which was a recreational machine for beginners. In 1985, Suzuki introduced to the industry the first high-performance 4-wheel quad bike, the Suzuki LT250R Quad Racer. This machine was in production for the 1985-1992 model years. During its run, it underwent three major engineering makeovers. However, the major core features were retained. These were: a sophisticated long-travel suspension, a liquid-cooled two-stroke motor and a fully manual 5-speed transmission for 85-86 models and a 6-speed transmission for the 88-92 quad models. It was a machine exclusively designed for racing by highly skilled riders. Honda responded a year later with the FourTrax TRX250R quad -a machine that has not been replicated. Kawasaki responded with its Tecate-4 250. In 1987, Yamaha introduced a different type of high-performance machine, the Banshee 350, which featured a twin-cylinder liquid-cooled two-stroke motor from the RD350LC street motorcycle. Heavier and more difficult to ride in the dirt than the 250s, the Banshee became a popular machine with sand dune riders thanks to its unique power delivery. The Banshee remains hugely popular, but 2006 is the last year it will be available in the U.S. (due to EPA emissions regulations). In Canada, however, the Banshee will be back for the 2007 model year, still featuring the same parallel-twin, 350cc, two-stroke engine that made the machine famous. At the same time, development of utility Quads was rapidly escalating. The 1986 Honda FourTrax TRX350 4x4 quad bike ushered in the era of four-wheel-drive Quads. 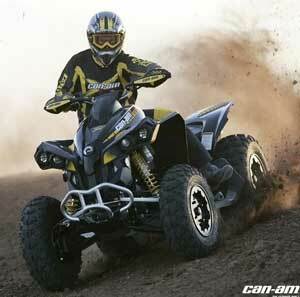 Other manufacturers quickly followed suit, and 4x4 quad bikes have remained the most popular type of Quad. These machines are popular with hunters, farmers, ranchers and workers at construction sites. Safety issues with 3-wheel Quads caused all manufacturers to switch to 4-wheeled models in the late '80s, and 3-wheel models ended production in 1987, due to consent decrees between the major manufacturers and the Consumer Product Safety Commission -- the result of legal battles over safety issues among consumer groups, the manufacturers and CPSC. The lighter weight of the 3-wheel models made them popular with some expert riders. Cornering is more challenging than with a 4-wheeled machine because leaning into the turn is even more important. Operators may roll over if caution isn't used. The front end of 3-wheelers obviously has a single wheel making it lighter, and flipping backwards is a potential hazard, especially when climbing hills. Rollovers may also occur when traveling down a steep incline. The consent decrees expired in 1997, allowing manufacturers to once again make and market 3-wheel models, though there are very few marketed today. Models continue today to be divided into the sport and utility markets. Sport models are generally small, light, two wheel drive vehicles which accelerate quickly, have a manual transmission, and run at speeds up to 90 miles per hour (120 km/h). Utility models are generally bigger four wheel drive vehicles with a maximum speed of up to 65 miles per hour (104 km/h). They have the ability to haul small loads on attached racks or small dump beds. They may also tow small trailers. Due to the different weights, each has advantages on different types of terrain. Six wheel models often have a small dump bed, with an extra set of wheels at the back to increase the payload capacity. They can be either 4 wheel drive (back wheels driving only), or 6 wheel drive. 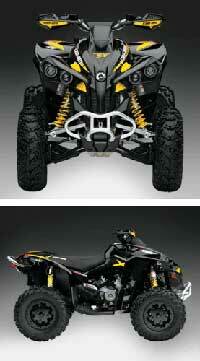 There are also 6 and 8 wheel models where the rider sits inside, known as AQuads (amphibious all terrain vehicles). These vehicles may float and are designed to go through swamps as well as dry land. These were around in the United States long before 4 and 3-wheeled vehicles were introduced (by Honda and other Japanese companies). Current brands of these machines include Argo and MAX. They consist of a fiberglas or hard plastic "tub" with low pressure (around 3 PSI) tires and use a skid-steer steering setup. Though not as fast as other Quads, they can be operated with precision at slow speeds, and, of course, have the ability to float. The spinning action of the tires is enough to propel the vehicle through the water, albeit slowly. Outboard motors can be added for extended water use. Technically, these AQuads are not true Quads by the ANSI definition of an all-terrain vehicle. Often they have steering wheels or control sticks rather than motorcycle-type handle bars and are intended for more than a single rider, in contrast to Quads that meet the ANSI definition.